July 2009. Just came back from my trip to China to see the TSE 2009. Over the years, I have changed the equipment I am using during a Solar Eclipse. The intention of this web page is to show such an "evolution" and provide information for those eclipse chaser enthusiasts on the errors I have made in the past so that you can avoid them. The hardware involved was a 35mm film Nikon Camera (F65) mounted on a very light weight Vivitar tripod which had no additional weight added in order to have it steady. You can also see that the tripod was extended all the way, making it unstable. The lens involved in the 35mm camera is a 200mm, which proved not to be enough for the pictures I would have liked to take. I also used a Sony Handycam on an even worst tripod also very unstable. 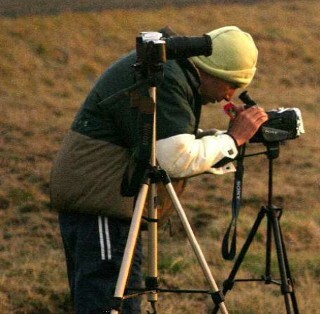 It was the kind of tripods you got with the camera included years ago. The camera had Mylar as a solar filter, and the result was a very poor video of the eclipse. bottom of the tripod) in order to make it more steady. Same camera Nikon F65 35mm film. The lens is now a 400mm lens with a Thousand Oaks Optical filter. I also used a 2X teleconvertor in order to achieve 800mm focal lenght. At the right of the picture you can see the Sony Videocamera again with the same very unstable tripod. I was not using any additional telephoto for the camera, and the filter used was again Mylar. Ok, this was for me a big step forward in terms of the Hardware usage. I finally purchased a Manfrotto tripod which is by far better than the Vivitar tripod I was using in the last trips. On top of the Tripod there is the Manfrotto head 410. On top of the head I placed wooden support for two cameras. One is finally a digital, the Nikon D70 with the 400mm lens and the 2X teleconvertor. The other is the same Sony Videocamera which is now also using a 2X teleconvertor. The filters for both cameras are from Thousand Oaks Optical and they are not threaded, which makes it easier to remove during totality. At the right you can see my third camera, which is the 35mm F65 I used in the previous eclipses. It is mounted on the Vivitar Tripod. With the Nikon D70 and the Telephoto, I take the big pictures of the sun with good resolution. The video camera is always aligned with the Telephoto, so I can see through the video camera the same I see in the Telephoto. I got a good film of the eclipse. 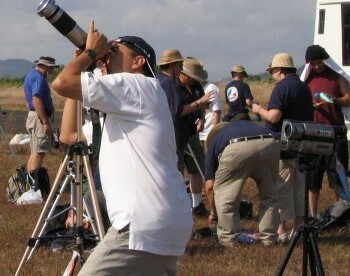 The Nikon F65 is used for a multi shot sequence of the eclipse, taking pictures every 5 minutes at a lower focal length (about 60mm) in the same frame without advancing the film. The outcome is a very nice picture. the 400mm focal lenght telephoto with the 2X teleconvertor, I went for a Meade OTA. Big Mistake! The OTA had a focal length of 1250mm, which made it just too much for the picutres. In most of the pictures I took in Russia the sun is not complete in the frame, since it was using almost all the frame and it was very easy to miss it. You can notice that now instead of a wooden support for the cameras, I am using an Aluminum support. This makes the overall setup steadier. In this other picture I am with my wife who is always traveling with me and has been supportive with my crazy hobby. You can notice that it was very windy. As a suggestion, do not make the same mistake that I did leaving the long camera straps loose. I had no problems, but it would be easy for someone to get into a strap and have a mess with my setup. Yes, this was Siberia! And we were in the beach! Weather was great and we had clear skies during the Eclipse. For this setup I did some changes. 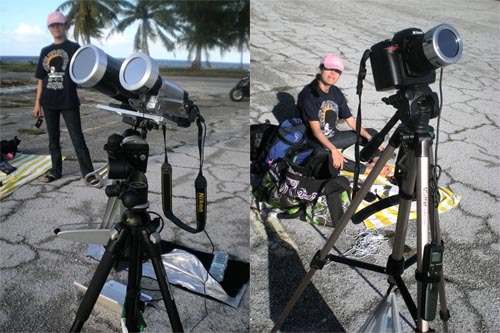 First of all, I was tired of moving the head of the tripod manually in order to follow the sun. Therefore, I purchased an Astrotrac. That is the device that you can see at the front of the picture, below the video camera. The astrotrac is capable of tracking the sun for up to two hours, and it is very light weight. Secondly, I realized my mistake in Russia of trying an OTA which provided just too much focal lenght. The 400mm Telephoto used in previous eclipses is of not a good quality, and the 2X teleconvertor made it worst. So, for this eclipse, I used a Nikon 500mm mirror lens. That is a very compact lens and provides a very good image size of the sun on the frame. - Aluminum base that holds both cameras. This setup is very stable and provides good solar tracking. The Astrotrac uses a 12 volts battery. This is the latest setup I have used, and I think it will be the same one for some time. I am satisfied with it. I replaced the 500mm mirror lens with a Stellarvue Raptor 70 ED Raptor Telescope. The Telescope provides 400mm focal length, and very good optics quality. I also replaced my old Sony Videocamera with a newer camcorder. The complete sequence of shots was taken with my Nikon D90 controlled by Eclipse Orchestrator running on a laptop.